When browsing a webpage, you typically can click the right button on the mouse to reveal a context menu. The right click context menu usually has options such as Back, Forward, Reload, Stop, and View Page Source. When right clicking on an image, you have have the option to save the image or even set it as the desktop background. It’s rare but sometimes you want to disable the right click context menu. To disable the right click context menu you can set the oncontextmenu event to return false. If you only want to disable the right click context menu on a small part of your site, for example an image you don’t want your visitors to easily download or save you can add the oncontextmenu property to any div or img tag and disable the context menu only in that HTML tag. For the following examples, I’ll using the following CSS classes, which I hope are self explanatory. 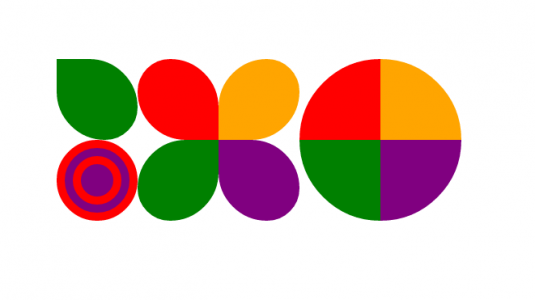 The easiest use of border-radius is where all four corners have the same border curve radius. If all corners have the same curve radius all you need to supply is one px radius value. In the examples provided in this tutorial, we fixed the width and height of the box div to be 100px. If we increase the border radius to 50px we can have a perfect circle. What makes the border-radius property powerful is that you can set a different radius for each corner. Just enter four values, the first one will set the radius for the top-left corner, the second sets the top-right, then the bottom-right, and the bottom-left corner. If the value 0px is used, that corner will not have any curvature. The following HTML examples sets different border radius values for each corner generating a leaf looking shape. Placing four similar div tags in place, you can create a four leaf clover shape or a circle. You can even nested rounded div tags to create a bullseye image. As of this time, Chrome, Safari, and Firefox support border-radius. It’s incredibly easy to generate great looking pie charts with jqPlot. 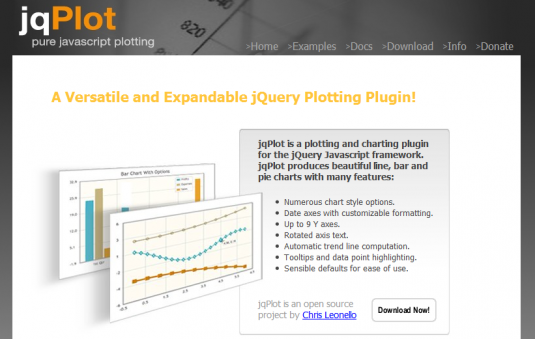 jqPlot is a jQuery plugin that can be use to generate pure HTML5 charts. 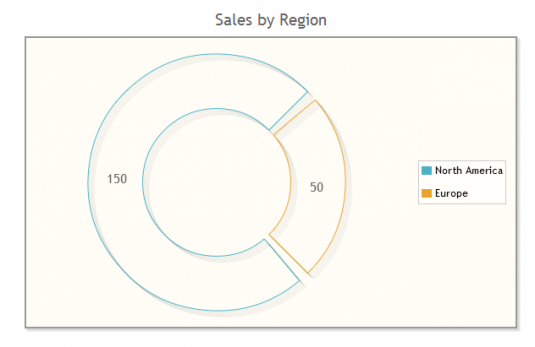 Create pie charts in jqPlot is as easy as it is to create bar charts, the only difference is how we pack the data. The jqPlot graphs are drawn on a div tag and this example will require the following HTML snippet. A single slice of a pie chart is stored in a two element array where the first elemnt contains the string label and the second element stores the slice data value. A single pie series is made up of one ore more slices, and a pie chart may have one or more series. The typical pie chart is made up of one series, but there are some charts that can allow for multiple pie series. jqPlot will all compute the percent for each slice based on it’s value, so the slice for North America will be 75%, and Europe will be 25% for the the values 150 and 50, respectively. The pie chart generated from the above code will be simple and undecorated. By default, the showDataLabels property shows the percent of the slice. To show the slice data value, rather than the percent, set the dataLabels property to ‘value’ such as the following code. You can further change how the pie chart is rendered by setting the fill, sliceMargin, and lineWith rendererOptions object properties. The fill property accepts a boolean value, and you can specify the sliceMargin and lineWith with an interger value. You can also specify the angle from which to start with the startAngle property. Putting all this together, you can create a pie chart like the following. 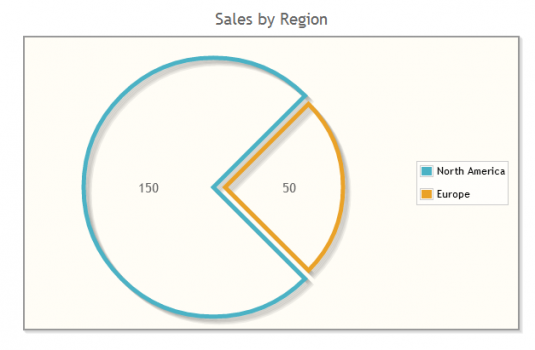 Using the same data and same options object, you can render a pie chart as a donut. To display a donut chart you will need to load int the jqPlot donut renderer. Once you have loaded the donut renderer, just update the render property in the options object. In the above example, divId is the String object containing the name of the div on which to draw the chart. The dataArray variable will hold the data for the chart and the optionsObject will have configuration properties used to display the chart. 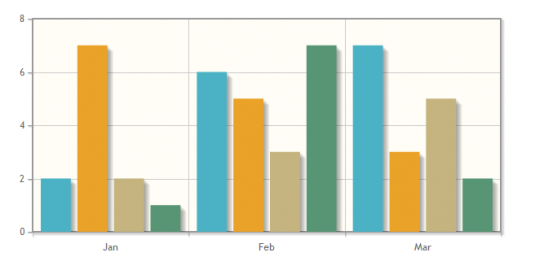 For a bar chart, the chart data is an array of nested arrays holding the values each tick along the x-axis. In the above example, we are tracking three points along the x-axis so our we have three data points for each series. The options object is used to configure how the rendering of the chart, it specifies that this should be a bar chart and sets the x-axis. We can easily change this from a bar chart to a bar stacking chart by adding one property to the the options object (stackSeries: true). By adding one line of code we can drastically change the chart we generate. Another options you may want to set is the title, to add a title to your graph setht the title poperty. You can further customize the label for each of your series by adding the series option object. 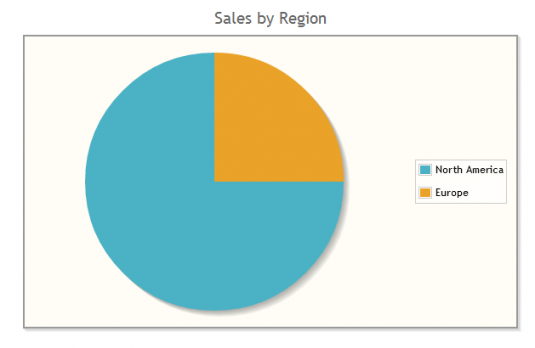 Most business applications display some amount of data in charts and graphs. If a picture is worth a thousand words, then a clean visual representation of business data is worth a lot more. 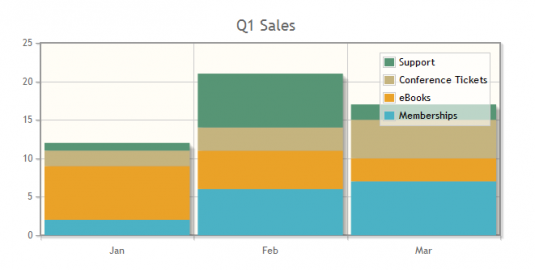 Business charts can condense a lot of data points into a easy to understand graph. In the above code, the callingFunction variable holds a reference to the Function object that called the basicFunction. Unfortunately, there is no clean way to get the function name out of the Function object returned by the caller property. This is made slightly more difficult because somethings functions don’t have names if they are created anonymously. If you print or log a Function object, it displays the function definition in its entirety.